Drive is Nicholas Winding Refn’s first return to a crime story since his final installment in the Pusher series, but the director winds up hewing to close to his own conventions to make truly compelling cinema. When I first sat down to watch Drive, I was not entirely sure what I what sort of film to expect. I knew the film starred Ryan Gosling as a getaway driver, but that was about it. I think that sense of mystery can really work in a movie’s favor – but now that the film’s over, I can’t say I’m terribly satisfied with the results. It’s not that Drive is an incompetent film. On the contrary, many techniques that Refn uses in Drive are of the highest technical proficiency, from shot framing to how some of the characters are artfully fleshed out despite the rather simplistic minimalist dialogue. However, Refn’s strong affinity for long periods of impenetrable silence where characters communicate their emotion through facial expressions proves problematic when matched with the protagonist of Drive. Ryan Gosling’s character, “the driver,” is supposed to be enigmatic and emotionless. Therefore, whatever feelings are meant to be communicated through Refn’s silent scenes are lost on the audience, and, quite plainly, didn’t work well to captivate my interests. In Refn’s Valhalla Rising, which has many of the same problems as Drive, the audience can at least connect with the fact that Mad Eye is a prisoner in spite of the fact that other than that, he had little in the way of backstory. It becomes possible to empathize with One Eye due to the circumstances we find him in, while a disconnect remains in Drive between the audience and the driver – we are asked to find humanity in someone who appears to be a good-looking, young, employed white male in modern America, and also enjoys doing crime and killing things on the side. At least he’s trying to express something here. Sort of. The instinct might initially be to go with the Gosling-hate crowd that’s hot in Hollywood right now and blame the lead for the disconnect, but I think he wasn’t given much to work with here and he certainly has shown his dramatic chops in other films. Having said this, it is hard forgive the perpetually blank face Gosling wears that lacks any of the subtleties of other landmark performances of more seasoned actors. Characters in television and film who show very little in the way of emotion on the outside carry their performances through minute twitches and minor facial alterations. These nuances are a product of their complex backstories and deep personalities; examples of this include Gary Oldman as George Smiley in Tinker Tailor Soldier Spy or Giancarlo Esposito as Gus Fring in Breaking Bad. Whether this impenetrable enigma of a character is a product of Refn’s direction or the limits of Gosling’s acting remains a mystery, but it does not work at all in the film’s favor – particularly when, as a result of with Refn’s trademark silences, the lack of personality is accentuated. Whatever the faults in Drive, I admit the acting probably isn’t to blame. Carey Mulligan gives a very solid, unobtrusive performance as the driver’s neighbor, Irene, although there’s nothing particularly stand-out about her acting. Bryan Cranston, whom I have come to appreciate much more after his role as Walter White in the television series Breaking Bad, gives a very convincing and satisfying performance as a greedy-yet-endearing mechanic named Shannon who works as the driver’s boss. Unfortunately, Christina Hendricks (Firefly, Mad Men)feels wasted in a minor role – her considerable acting chops are barely utilized in her 2-3 lines of irrelevant dialogue. The two head-honcho criminals intimately involved in the main plot are played by Ron Perlman and Albert Brooks. 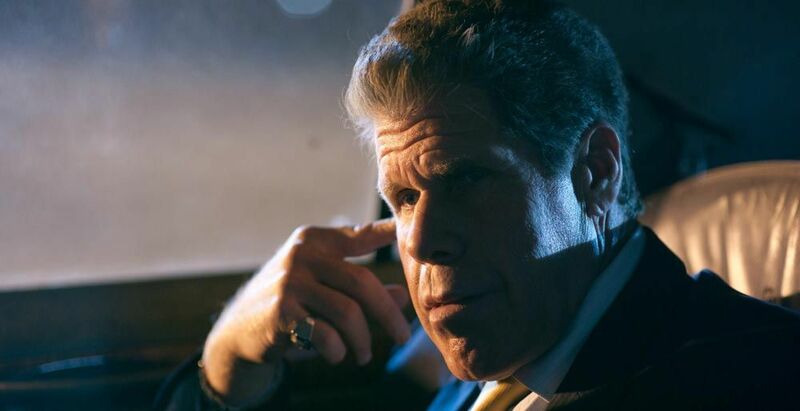 Of course, Ron Perlman is a total powerhouse while Albert Brooks plays a horribly sadistic version of, well, Albert Brooks, and both serve as very respectable antagonists. One of the most glaringly odd and off-putting choices Refn made in making Drive was the retro motif he used for the soundtrack, the credits, and the overall aesthetic of the film. Colors in each scene are bright and appear to give off a neon sheen, and lights are brighter and stick to a bright pink, blue, and orange color palette. This, combined with the retro soundtrack, might actually have been a pretty great design choice – but for Drive, it feels totally unrelated to the film’s style and setting. Worse than that, those “silent” scenes I mentioned earlier are actually unceremoniously punctuated by the soundtrack, and the result is probably not what Refn intended. I felt thrown off by the fact that the soundtrack seemed to be trying to fill for the missing spark between the characters. This dichotomy merely exacerbated my frustration with how stagnant the tension felt as opposed to enhancing how invested I was in the characters’ situations. Drive is very obviously a Nicholas Winding Refn movie, but this time he self-indulged to a fault. Fans of the director will likely not be disappointed with the film whatsoever. Much like myself and director Wes Anderson, whose films I will always go and see because something about his style clicks with me. Nevertheless, I must caution that this movie follows many of the same beats as Vallhalla Rising before it, and that the aforementioned issues of character development do keep Drive from attaining the heights it was trying to achieve. A Note About Orange and Blue – Using orange and blue to color a scene is one of the most commonly used film techniques and can be found in almost any film. When used in moderation, it makes a lot of sense – but Drive uses this color scheme constantly, almost to the degree of Harry Brown. It’s nothing major, and it’s not really a critique, but I thought I would point it out for those of you who pay attention to such things. Another Note About the Film – I don’t know that a movie like Drive need exist when a masterwork like Sling Blade tells a similar story in a far more compelling manner. Billy Bob Thornton’s character manages to instill unending endearing qualities into his performance and around that central pillar, the rest of the movie takes shape. Drive lacks that pillar and ends up suffering for it.